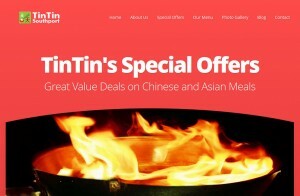 Just for customers’ of TinTin Southport, we are offering a special price of £110 on our WordPress Web Design Package, just quote “TinTin Offer” to get your special offer price! Also, please note TinTin Southport’s own website was designed by us within the scope of our standard package, and then expanded by the manager at TinTin to include a photo gallery page. Choose from a selection of premium WordPress themes to base your site upon. Inclusion of your Company logo design onto the website. Upto 4 static pages, or 3 static pages plus a Blog page. Add new pages to your site (as many as you like). Upto 2 POP3/IMAP email accounts. The only item which is not included within the base package price is the registration of a domain for your website. As most clients prefer to retain ownership of their domain, we suggest that you register your domain it via a company such as 123-Reg who offer very reasonable prices for domain registration. Once registered we can point the domain to our webservers to make your site live, but the domain itself will always be your property and fully under your control. Please Contact Us or to discuss your website design requirements, or just complete the enquiry form below, and please quote “TinTin Offer” to get your special offer price!